Two spacious compartments with soft-close doors and adjustable shelves. One deep bottom drawer for functional storage. Soft-close and full-extension European glides for full easy access. Fluted handle and leg plates in Polished Chrome or Brushed Nickel. your bath with the Vicenza Collection, Madeli's flagship collection. 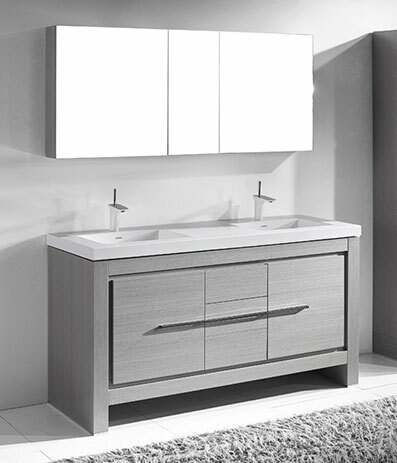 The royally design features a rich, Walnut or Ash Grey woodgrain or a Glossy White finish accented with decorative, polished chrome handles and leg accents. Customizable basin and countertop options include pristine White ceramic basin accented with a glass countertop, X-Stone™ solid surface and Quartzstone™. Superior craftsmanship is evident in the larger storage compartments with concealed interior pull-out trays and two spacious drawers, all with soft-closing European hardware. The rich polyurethane protected finish adds beauty and utmost durability. Couple that with fluted bar pulls in a sophisticated polished chrome finish, and you have a vanity that will become the focal point of your bath.